When I was younger, I remember watching some of my favorite Disney Channel shows like That’s So Raven, Lizzie McGuire, Hannah Montana, and Wizards of Waverly Place. I remember watching these tv shows on Disney Channel, seeing countless of actors and actresses that I admired. However, as I grew older, I have come to notice and realize that there were not many actors and actresses who were Asian or Asian-American. I felt that no one was representing my race or culture; I felt left out. If there were any Asian actors and actresses that I saw in tv shows or movies, they would only play the one dimensional, stereotypical roles: the geeks, nerds, foreigners, etc. The only Asian character I felt that I could somewhat relate to an extent was Mulan, a Chinese female heroine, who saved the whole of China. Let me ask you something, was there a moment where you noticed an absence in Asian representation, or can you tell me, how many Asian Hollywood stars can you name? Why do you think that it is okay to whitewash roles meant for Asians? According to an unnamed casting director, it is because we are “not expressive” enough. Nancy Wang Yuen, a sociologist and author of ‘Reel Inequality: Hollywood Actors and Racism’, said that the casting director told her that “Asians are a challenge to cast because most casting directors feel as though they’re not expressive.” The casting director goes on about how Asians are “very shut down in their emotions,” and is a “challenge” for him and other directors when they have to get them (Asians actors and actresses) “to act and get some kind of performance.” Apparently, “if it’s a look thing for business,” Asians can do that when “they’re at a computer or like a scientist or something like that.” Well, here’s some proof that is not true. In response to the casting director’s remarks, people on Twitter took the opportunity to show just how wrong he is and how expressive Asians and Asian-Americans can be though the hashtag Expressive Asians. People showed many great examples of expressive Asians, from Asians/Asian-Americans teenagers like myself to actors and actresses in movies or dramas. If you were to watch your own television shows and movies, take note, because you can clearly see that there is very little Asian representation, whether it is people from East Asia to South Asia. In a study that measured diversity in Hollywood conducted by USC’s Annenberg School for Communication and Journalism, we learn that half of the films and TV shows analyzed “had little to no Asian speaking characters.” Another study had also found that Asians made up“4.4% of speaking characters across the top 100 grossing movies that year, 2014. According to PBS, out of 30,000 Hollywood film characters, only 5.3% were Asian. This number alone shows the struggles of Asian actors and actresses are fighting for visibility in your industry. In addition, The Asian American Performers Action Coalition or AAPAC released a statement saying that out of all the Broadway productions that opened in the last five years, Asian American consisted of only 1.5% in contrast of the 81.8% Caucasian. And of the 3530 roles casted in Broadway Theaters in the last five years, only 54 Asian American actors were casted. However, even if Asians actors or actresses do get casted for a part in a film, their roles are mostly one dimensional, portraying Asian stereotypes that can sometimes be very derogatory. From whitewashing to getting secondary parts to the plot to playing stereotypical roles, Asians in your entertainment industry are fighting for visibility. The movie Ghost in the Shell is a perfect example of whitewashing Asian roles. Ghost in the Shell is an adaption of a popular Japanese manga series and is a remake of the original film with Japanese characters, but the main character is portrayed by Scarlett Johansson, a white actress? It does not make sense. Can’t you see all the criticism and backlash from whitewashing roles meant to be played by non-white actors or actresses. Ghost in the Shell was heavily criticized and only earned $59.1 million with their budget of $110 million. 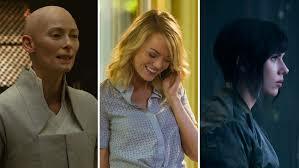 There are many more films/movies where Asians were whitewashed or encountered the problem of “yellowface.” Most recent examples of this can be seen in the Netflix series Death Note, another film based on a Japanese comic, or Aloha, where Emma Stone was casted to play a half-Asian character. Also, Matt Damon’s The Great Wall movie which was set in China, but the lead character was white. Of course, we also cannot forget about Mickey Rooney’s notorious role in Breakfast at Tiffany’s. Mickey Rooney, a Caucasian actor, played his role as a buffoonish Japanese business man with fake buck teeth and big round glasses. Not only is this portrayal of an Asian character highly inaccurate, it is also extremely rude and disrespectful. Do you really think that Asians look like that? How pathetic. Whitewashing is like painting white over a colorful mural. A whole culture and meaning is hidden from the world like the once colorful mural. I know that not many Asians go into to the entertainment industry as a career in the United States, but there are still rare opportunities for those who want to pursue in this career. Perhaps if there were more meaningful roles available for actors of Asian heritage, more would go into the industry, an industry where young Asians and Asian-Americans feel more represented. Maybe you can take note of Disney Channel’s new Asian-American centered tv show Andi Mack. Hollywood, if you have not noticed the criticism and backlash for whitewashing roles meant for people of other culture, then you will be in for a big one and lose a lot of money. And to all my fellow movie watchers, help support Asians/Asian Americans and other people of color to stand up against Hollywood by not watching movies that have white washed Asian’s or other culture’s roles.